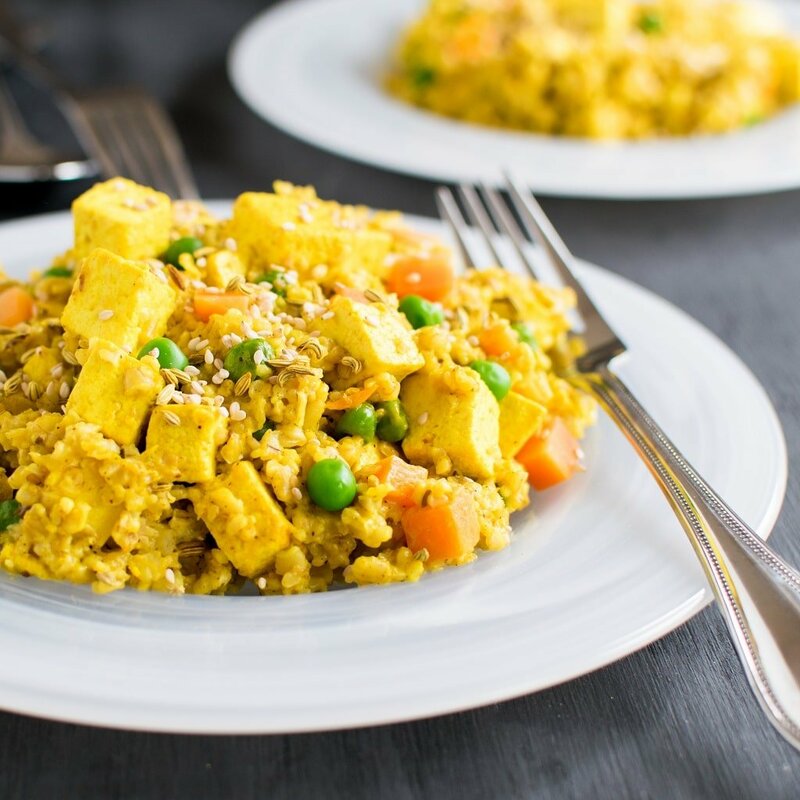 Turmeric Tofu Oatmeal is a wholesome meal with abundant health benefits. This recipe not only looks vibrant but is exquisitely pleasurable. This savory oatmeal dish satisfies the craving of a pilaf and yet it’s a low carb and high fiber meal. I love oatmeal especially if it’s savory and a satisfying lunch. Often, it happens that I run out of ideas for lunch and chewing on salads every afternoon isn’t really exciting. Usually, for lunch I look for something filling that can sustain me through odd evening hours. This dish helps me consume healthy combination of whole grains, protein and other nutrients. I can happily say that Turmeric Tofu Oatmeal fulfills all my requirements. 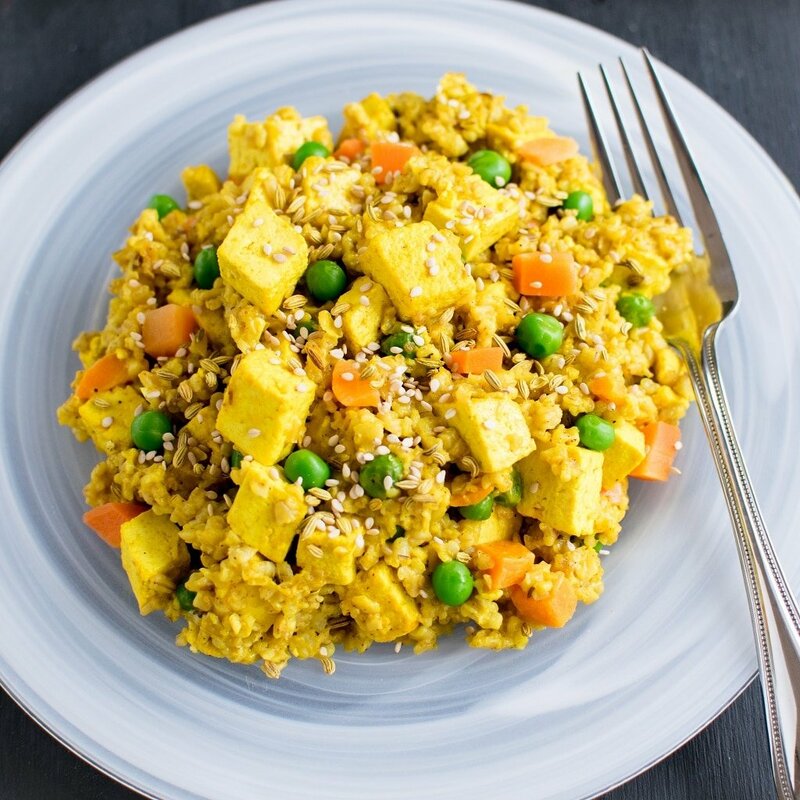 Turmeric Tofu Oatmeal has plenty of whole grains, good fats, fiber, and protein. it is loaded with antioxidants and anti – inflammatory ingredients. I marinated tofu in turmeric powder and salt and let it settle. This combination enhanced the flavor of tofu immensely and made it even more desirable. Next, in a saucepan, I cooked oatmeal in water. Lastly, in a frying pan, I flavored the warm olive oil with some herbs and spices. Then folded in marinated tofu and cooked oatmeal. In the very first bite of my new recipe I was completely zapped with its decadent taste. I savored this dish so much that I decided to make another batch. I refrigerated it for my lunch the next day. This recipe is also a make ahead lunch that would need just a little warming up before serving. I enjoy Turmeric Tofu Oatmeal with some pickles and yogurt. This makes a healthy lunch for my husband as well at his work. This dish has a mild Indian flavor. When I sauteed all the spices in little yogurt its aroma fulfilled my entire kitchen increasing my cravings ten folds. Oatmeal once again wins over me because of its versatility. 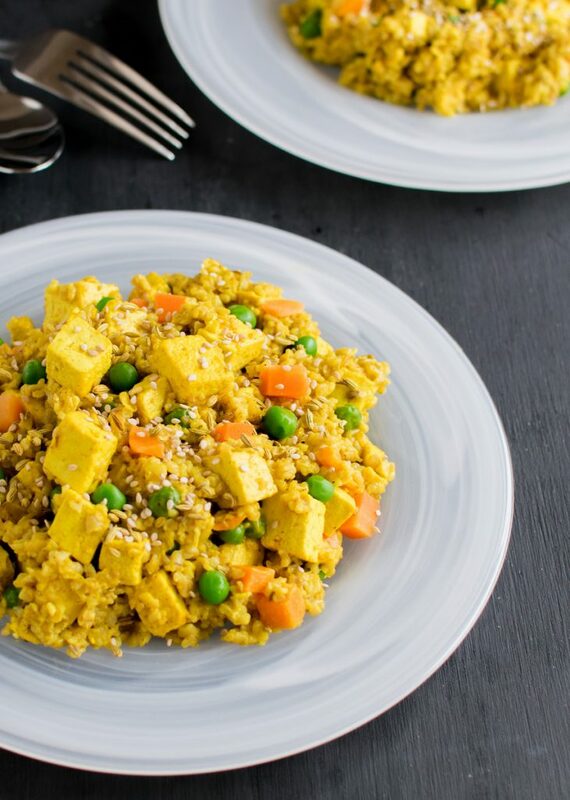 Turmeric Tofu Oatmeal is quite regular for us. Moreover, I am happy with the fact that I was able to convince Rohit to eat oatmeal for his lunch contrary to his belief that oatmeal is not only a breakfast item. This dish is a plate of nutrition and deliciousness. 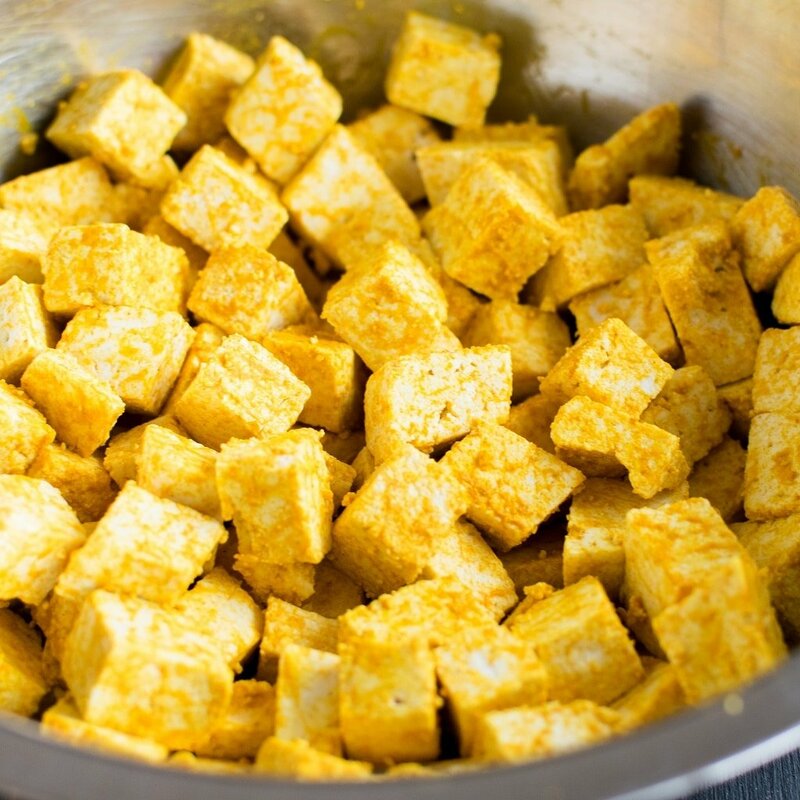 In a large bowl combine tofu, turmeric powder and ½ tsp salt. Mix and keep it aside. In a saucepan boil water and add oats. Cook oats on a low – medium flame until water is absorbed and chewy. keep it aside. Heat oil in a nonstick pan. Add cumin seeds, fennel seeds, sesame seeds. Let it crackle. Add chili powder and mix the spices. Add yogurt and stir well until blended. Toss in tofu. Mix gently without breaking it. Then cook covered for few minutes sauteing at intervals so that tofu cooks from all sides. Add peas and carrot. Mix well and cook for a minute. Lastly, fold in the cooked oatmeal and the rest of the salt. Cook for couple of minutes or until the oatmeal is slightly more dry almost like pilaf form. It's a dry but sticky oatmeal pilaf in consistency. Feel free to adjust salt and chili powder as per taste. I love the idea of this savory oatmeal! It looks and sounds so healthy! My husband has been wanting to add turmeric into our diets more, so I’m going to send him this recipe! I’ve never tried a savory oatmeal before, but I’d love to. Turmeric is so beneficial for digestion and so flavorful too! What a great looking recipe for me to try something new! I love how healthy this is! I’ve never tried savoury oatmeal like this before but I’m really excited to try it. Love all the flavours in this. Oh this looks so tasty! All those colours and flavours have me wanting to reach through this screen with a fork and take a big ol’ bite. I’ve never thought of oatmeal for lunch, but why not? So many people have breakfast for dinner. We don’t like sweet breakfasts and I can see how oatmeal, made in a savory way would be excellent. You’ve given me so many ideas about a great lunch and breakfast. I’m looking for new ways to use turmeric. Totally agree that oatmeal is not just for breakfast. What an interesting way to use oatmeal!! I have never seen a recipe like this but it sounds AMAZING!! Loving that this is vegetarian and vegan! Such a great substitute for a new and different type of lunch item! This sounds so good. Easy to make, healthy and quick. Ideal for a busy day when you want to keep it light and healthy but filling. Have saved your recipe .Will try soon. Savory oatmeal?! Oh I need to give this a try. Sounds super delicious. I actually never eaten oatmeal that way. This is perfect quick family dinner. I will definitely make this for me and my family.